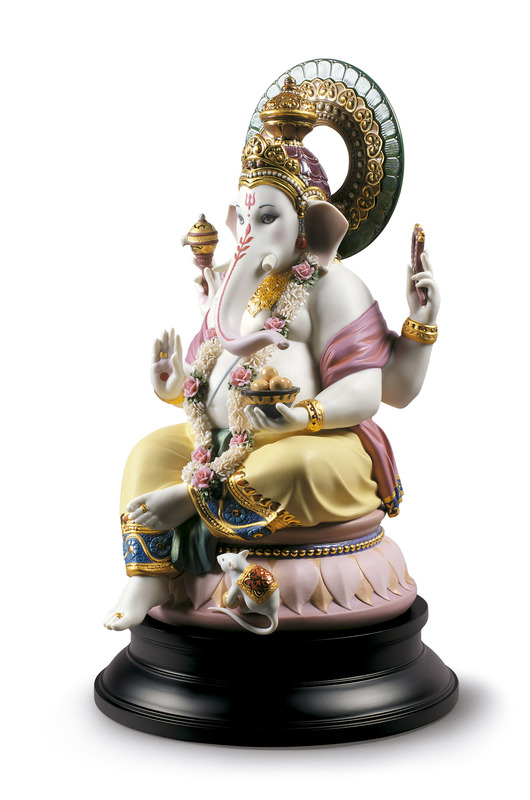 The legend goes that Ganesha, the son of Shiva and Parvati, was born while his father was fighting against the Asuras or devils. When he returned from war, Ganesha did not recognize him and a fight broke out between the two in which Shiva beheaded his son. Shiva went down to earth with the promise of giving his son the head of another being and it turned out to be an elephant. 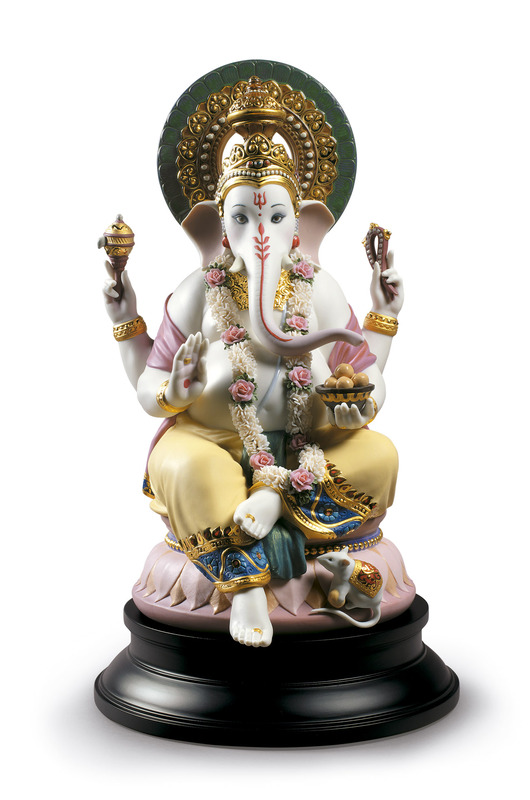 Believed to be the eliminator of obstacles, Lord Ganesha transcends its hug importance in the Hindu culture and becomes a universal symbol of wisdom. 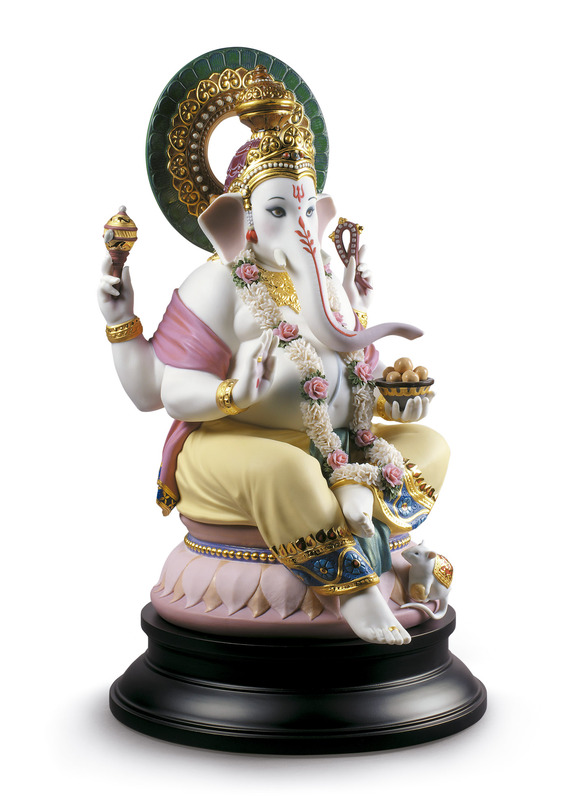 Lladró's artists have recreated the Hindu god of wisdom and knowledge in a winning combination of matte porcelain with enamels, golden luster in various different parts of the piece plus metallic effects paying tribute to the wealth of its iconography. Particularly outstanding is the highly elaborate ornamentation, which features an exquisite filigree work enriching every detail of the piece, including an elaborate garland of over 206 delicate flowers, one of the brand’s signature elements.